When mentioning Myrtle Beach golf there is always one course to be sure to be brought up. Caledonia Golf & Fish Club is located just a few miles south of Myrtle Beach in Pawleys Island, S.C. and year after year continues to garner national recognition. 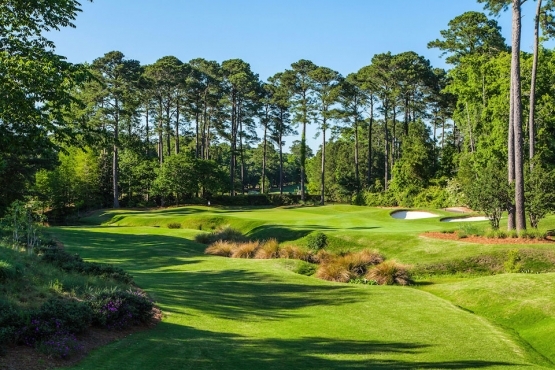 Famed golf course architect, Mike Strantz, had the perfect setting to design this wonderful Myrtle Beach golf course as it sets on an old historic rice plantation. When entering this unique property you will be awed by the centuries-old live oaks that lead up to its world class antebellum clubhouse which reeks of Old-South charm. The course itself features large creative greens that can be guarded by lakes, streams and imposing bunkers. Moss-draped live oaks can frame many of the holes and offers a rustic feeling while traversing the fairways. Beautiful flowers of all varieties blend into the natural surroundings. This course can be very challenging but different teeing options can make sure that golfers of any level can enjoy this unique golfing experience that will be sure to be remembered for a lifetime. Caledonia would be the perfect course to add to any of our other Myrtle Beach golf courses to create the perfect Myrtle Beach golf package. Myrtle Beach golf lessons are available at Caledonia by world Class golf instructors. This Myrtle Beach experience will be one that you will treasure. Book your Myrtle beach vacation today! I have been the trip planner for our annual Myrtle Beach trip for 15 years. We have friends that come over from England and all over the US. The only course that everyone always demands that we play is Caledonia. I have been luck enough to have played all over the world and this is one of my all-time favorites!